Things are settling down a lot more now, which is nice. We’ve all settled into a routine, and those of you who know me well would be in awe of my new cooking skills! I can now whip up dhaal bhaat with achaar and tarkari for 30 children without batting an eyelid! Aamaa took me to her house on Sunday night for dinner. We didn’t do much except watch tv, and Aamaa painted my nails, but it was a nice break, and afterwards Priya’s husband dropped me back at the orphanage on his motorbike. I discovered that I do still really love the thrill of riding bikes, although I probably don’t have the bottle to be more than a passenger these days! There was a moment when we squeezed between a car and a wall and I wondered if I was about to lose my kneecaps, but it was fun! I was a bit confused the next morning when Priya called, and I was summoned back to Aamaa’s house at 11am. They told me to cancel school, and bring the three babies with me. So Anil and I took a taxi with the little ones ( I did get a slight pang of nerves about having three toddlers in the back with me and not a seatbelt between us, but there was nothing I could do about it, and it was fine). When we arrived it turned out that they were cooking up a storm, as it was some special day for remembering the dead, and Aamaa had missed me and my cooking skills, so she’d sent for me to come and help! I was so flattered – she often summons some of the other women to go and help cook at her house, but it was a real honour that she wanted me specially – I was sooooo chuffed! So I chopped away happily, and was introduced to their family priest, who was on the balcony with Buaa (Aamaa’s husband) performing various complicated procedures involving tikka, marigolds, rice and various food items. 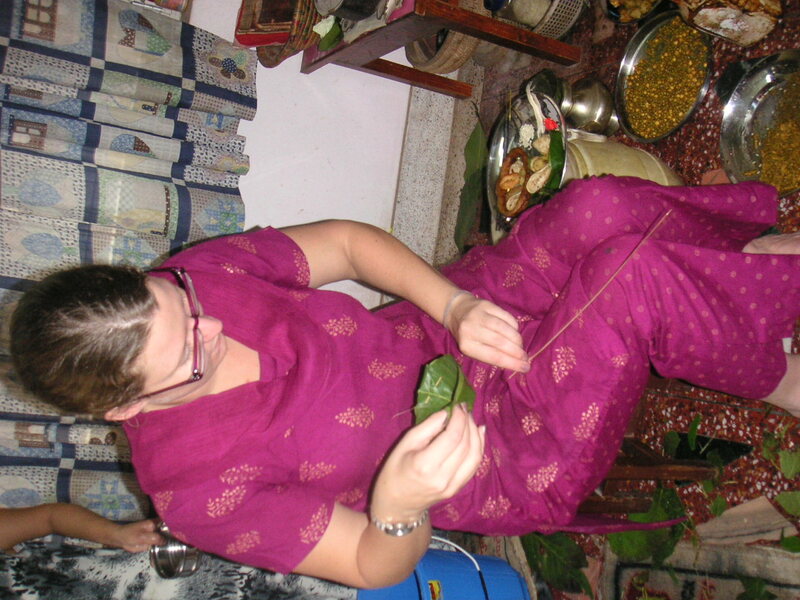 All the food for the ceremony was in these little bowls made out of leaves, which Aamaa showed me how to make. There were tons of different dishes and we ate until we were stuffed, and then I got another bike-ride home, this time dodging death when a cow walked into the road suddenly. I still haven’t got used to the cows, even after two months, you can just walk round a corner, and there’s a massive beast in your way! Obviously, the law is very clear about injuring cows, (Nepal’s national animal) and I’m sure if they had a highway code here it would indicate that the correct procedure is to crash into a wall if necessary to avoid hitting a cow. Poor old Alan keeps getting rammed by cows, as he has to walk down a narrow alley from his house to the orphanage, and the cows don’t like it if you’re in their way! Last Friday I went out with Alan, Dom, and my new Danish friend Mari. Mari is lovely, and terribly passionate about everything. She’s the kind of person who could easily start a cult if she wanted to – people just naturally hang on her every word. Anyway, she was very animated and excited, as she’d just come back from a ten-day meditation course (the Vipassana method for anyone who’s interested). She raved about it, and how it’s tucked away in the mountains, and so beautiful and intense, and by the end of dinner, all three of us wanted to go too! Literally the next morning, both Alan and Dom went to sign up for it, as the next course starts next week, although I’m going to wait and think about it some more. It does sound lovely, and I like the idea of ten day’s peace and quiet, away from the orphans in a beautiful mountain setting. You can go for gentle walks and take in the view etc. However, it’s also a hard-core meditation centre, and for ten days straight you get up at 4am (no, I’m not kidding) and meditate for ten hours, with breaks for lunch etc, and then go to bed. You’re not allowed to take any books with you, or writing materials to distract you, and you’re also not allowed to talk – not just for the meditation part, but for the whole ten days! Now, everyone has their own personal Everest to climb in their life, and I think this could be mine! I love the idea of a serious challenge, and not talking at all for ten days would be way harder than trekking up to base camp (for me anyway!). Better go there, leaving you all to contemplate the chewiness of meat as it’s time for me to head back for a science lesson this afternoon. ps – What if I couldn’t talk afterwards? What if my vocal cords froze and I became mute forever? The horror, the horror! This entry was posted in 2007, Nepal, Vipassana and tagged 2007, meditation, Nepal, vipassana by worldenoughandtimeblog. Bookmark the permalink.